Visible nearly 25 miles away, Spinnaker Tower stretches dramatically up into the sky, an incredible structure resembling a giant mainsail billowing in the wind. It’s design pays tribute to Portsmouth’s historic maritime heritage, whilst as a feat of engineering it stands as a powerful example of British ingenuity. With hundreds of thousands of visitors each year and astounding views from the top, Spinnaker Tower is undoubtedly one of the UK’s finest attractions. Weighing in at thirty thousand tonnes and standing 170 metres tall (TWICE as high as Nelson’s column), the Tower is a seriously impressive structure. It’s not difficult to see why it’s had more than two and a half million visitors since opening in October 2005. Take your pick between the 570 steps to the top, or the lightning-fast elevator, which whisks you up to the top in just 30 seconds. With affordable entry options to suit everyone, Spinnaker Tower is a real must-see. How do I use my Spinnaker Tower voucher? Enjoy your visit to Spinnaker Tower! Booking online saves you up to 15% off the price of entry! Is Spinnaker Tower available for private hire? For a truly unforgettable event, Spinnaker Tower is available for private hire, with a range of dining options, from breakfast to dinner. Is it possible to gift someone a visit to Spinnaker Tower? If you want to get a special someone a visit to Spinnaker Tower, gift tickets are available for all entry options, from the Tower & Sparkles Experience to good old General Admission. Do Spinnaker Tower offer refunds if bad weather ruins my view? If the weather is so bad the tower has to close, Spinnaker Tower will happily offer you a full refund. However, if the tower stays open and you are unsatisfied with the weather, you will not be entitled to a refund. Abseil bookings are subject to a £25 non-refundable deposit, if you cancel up to three months before the date of your booking. After this time, no refund will be available. If for whatever reason you have been refused entry to Spinnaker Tower, for example in the event of intoxication, you will not be eligible for a refund. 26 July – 3 September, open from 9.30am. Last entry 5:30pm. Taller than both the London Eye and Big Ben, Spinnaker Tower is the jewel of the south coast, offering staggering views across the bright lights of Portsmouth and the glistening waters of the Solent. For a view to a killer saving, pick up a Spinnaker Tower discount today. Spinnaker Tower offers you an incredible day out, with remarkable refreshments available from the Cafe in the Clouds, and beautiful vistas that you won’t forget in a hurry. Standing at nearly 200 metres tall, and visible from as far away as the Isle of Wight and even Worthing, Spinnaker Tower is one of the UK’s tallest landmarks outside of London. Attracting visitors from all over the world, all year round, it is the pride of Portsmouth and one of the most impressive tourist attractions in the entire country. 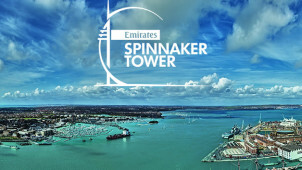 A visit to Spinnaker tower will be a memorable event that whole family will love. If you’re a thrill-seeker looking for some hair-raising fun, harness up and grab a great deal on Spinnaker Tower’s fantastic abseiling opportunities! The ultimate way to experience the wonderful vista, abseiling down the side of Spinnaker Tower is an amazing experience you’ll cherish forever. With a Spinnaker Tower voucher, you can make multi-storey savings, but (unsurprisingly) this incredible experience books up months in advance, so reserve your place today!